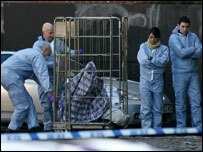 A post-mortem examination on a decapitated body found wrapped in a blood-stained duvet is due to be carried out later. Detectives have so far not been able to locate the head of the man, whose semi-naked body was discovered in Kilburn, north London, on Wednesday. A member of the public found the body, in a gold-coloured retail stock cage, behind shops at Kingsgate Place. Police have not yet named the victim, while the scene remains cordoned off. There have been no arrests in the inquiry and police say they do not know how long the body had been in the cage before it was found. The post-mortem examination is due to take place at St Pancras Mortuary.